When we lost Misty, I read a lot of advice, but very little that was specific to our area. Now that we have Misty back, I thought I'd do my part by explaining what we did, and what I thought worked. 0. You're chances are actually quite good. Many times during the subsequent four days, I referred back to this ASPCA study which found that 93% of lost dogs return safely home. That being said, luck favors the prepared. 1. Start looking right away. As soon as I got the call that Misty was lost, I left the office immediately. Fortunately, the folks at PBworks were very understanding (and had a lot of meetings saved up for me when I got back). While we didn't find Misty for another 90 hours, getting started right away helped us develop a better picture of the possibilities. 2. Report the lost dog everywhere you can. I posted to Facebook immediately, followed by Craigslist and Nextdoor. We also reported Misty to all the animal shelters we could. As it turns out the animal shelters in the Palo Alto area are mainly operated by non-profits and volunteers; as a result, their information systems aren't particularly advanced. The reporting mechanism is to go to the shelter in person and fill out a paper form. Some (but not all) of the shelters do put photographs of found dogs online, but they can slip through the cracks. Peninsula Humane Society (located in San Mateo near SFO...this is the biggest shelter, and takes in most of the found animals in San Mateo County since their receiving area is always open; they don't put pictures of animals online, so you have to go there in person to check). If you lose your dog in the South Bay, you will probably also need to check out the San Jose Animal Care Center. We visited Palo Alto twice and Peninsula Humane three times, and even though we didn't find Misty through a shelter, the shelter personnel were always very helpful and empathetic. It may seem old-school and inefficient, but this is the method that allowed us to find Misty. We made a simple flyer in PowerPoint, including those silly rip off phone numbers at the bottom. Since Misty is black and tan, we were able to get away with black and white, but color would usually be better. Paper flyers work because they are the only tactic that is both long-lasting and geographically targeted. I put up over 50 flyers across Palo Alto and East Palo Alto, focused on high traffic areas ranging from the Home Depot in East Palo Alto, to the entrances and exits to the Baylands trail, to the community board at the Pet Food Express in Palo Alto. I also posted flyers at every Philz, Starbucks, and Peet's in the area, as well as all the parks near our house. I always asked permission, and nearly everyone granted it (or told me that even though it was against corporate policy, I should put it up right outside the official grounds and that they would look the other way). In particular, Home Depot had me tape my flyer to their front door, and the folks at IKEA actually monitored their 300 security cameras for me. But I was warmly received everywhere. But the flyer that eventually brought Misty home was taped to the traffic light pole at the intersection of Greer and Embarcadero (more on that later). Flyers also offer a psychological benefit--even as my inability to find Misty got me feeling low, putting up flyers allowed me to feel like I was doing something productive that would increase my chances of getting her back. Folks in the Bay Area are both friendly and very attached to their pets. Nearly everyone I accosted on the street was friendly, despite the fact that I probably seemed a bit crazed at the time. The sole exception was an apparently homeless man who told me, "No, I haven't seen a stray dog, and I'm damn well not going to look for it." Not a nice reaction, but I figured that he might resent the fact that someone would do so much for a dog, and that no one was doing much for him. Many times, I got various hikers, bikers, and dog walkers to take my phone number and keep an eye out for Misty. This proved essential to her recovery. It's almost impossible to talk with people unless you're on foot, so be prepared to do a lot of walking. I probably walked 3-5 miles/day during the days Misty was missing. Wear sunscreen and a hat, and try to keep hydrated. I developed blisters, but kept going anyways. I was also fortunate that our neighbors whose dogs were Misty's friends also helped, and spent hours searching independent from us. Our neighbor Allen, whose dog Zen is Misty's "boyfriend," even made his own flyers to pass out. 5. Be persistent but unfailingly polite. Nobody has to help you. It may be infuriating that no one at the shelters is proactively calling you whenever a dog comes in, but you have to understand that everyone is busy and underpaid. Honey catches more flies than vinegar. For example, I called both the Palo Alto Police Department and the California Highway Patrol several times per day to ask about reports of stray animals. They didn't have to help me, but nearly every dispatcher took the time to look up the logs and provide me with whatever information they could. 6. Develop a theory and strategy. Friday, 3 PM: Received a call from someone who saw a flyer. He thought he saw Misty at Colorado and Bayshore. Friday, 7 PM: Talked with a woman on Oregon who thought she had seen Misty earlier that afternoon, heading towards the frontage road along 101. It was at this point that I began to panic. I did not like the sound of things; the data points suggested that Misty had moved steadily away from home and towards the freeway. Then things got quiet. Sunday: 8 AM: Got a call from a man who told me that he had just seen one of my flyers. "My English isn't good," he said, "But I think I saw your dog on the freeway last night, between Embarcadero and University." Sunday: 8:05 AM: I called CHP and confirmed that they had reports of a brown and black stray dog on the 101. The calls came in at 5 PM and 5:30 PM, but officers were unable to find the dog. Now I was really panicking. Alisha and I spent the morning driving around that stretch of freeway, and posted flyers at IKEA and Home Depot. The IKEA security people said that they had seen a small dog living in the bushes near the loading dock, but that it had been there for a week. Nonetheless, I told them to call me when they saw the dog again, no matter what the time. After spending the day driving from shelter to shelter, I spent the evening walking around East Bayshore, putting up flyers and trying to find a way to search the shoulder of the 101. At one point, I climbed up on the fence by the freeway, but after I saw a police car driving towards me, I beat a hasty retreat. I can only assume the drivers called in and said that they had seen a crazy-looking man climbing the fence on the side of the freeway. Sunday: 8:30 PM: Having learned my lesson, I called CHP and asked if they'd seen any stray dogs. "We have an officer on the scene right now, trying to track down what's been described as a brown chihuahua." They asked for my number and said the officer would call me, rejecting my offer to join the officer on the freeway to help with the search. CHP never called back, and when I called at 9:15 PM, I found out that the officer hadn't been able to locate the dog. Monday: 6 AM: The IKEA security team called; they had spotted the dog. Since the photos they texted me were inconclusive, Marissa and I drove over and staked out the location. Unfortunately, the dog was actually a male chihuahua. Still, it was good to know something with certainty. Monday: 5:40 PM: I got a call from the mother of a child at Marissa and Jason's summer camp. She had just seen my flyer, and recalled seeing a dog that matched the photo on Friday night, when she was coming out of the Baylands Athletic Center. Unfortunately, by the time she had turned the car around to look, the dog had vanished. Based on this fresh lead, Alisha and I drove over there, put up flyers, and talked to as many people as possible. Special thanks to the folks running the snack stand at the baseball diamond, the folks at the golf pro shop, and the folks at Anderson Honda, all of whom instantly directed me to place my flyers at their counter, in their bathrooms, and in their customer waiting area respectively. At this point, I had a theory. My guess was that Misty had made her way over to East Palo Alto. She was hiding in the Baylands, where there is plenty of cover, and would try to navigate back at night, but before it became completely dark. My plan was to take Tuesday morning and take flyers to all the offices in the Embarcadero/Baylands area, hoping to get more leads, especially since Misty would be getting hungry and thirsty, and might be desperate enough to come out during the day for good. Tuesday: 5:22 AM: I was awakened by my phone ringing. I vaulted out of bed and picked up. A woman who was biking to work along Embarcadero had just seen Misty walking near the Shell gas station just off the off-ramp. Alisha and I drove over their and were on site by 5:32 AM, but she was nowhere to be seen. At this point, we split up. Alisha drove the car to cover more ground, and I jogged on foot so I could talk with all the people who were out and about at 5:30 AM. In addition to the homeless guy I mentioned earlier, there were quite a number of hikers and joggers. One pair of hikers were women in their 50s. When I told them what I was doing, they went back home, got their glasses and phones, looked at the picture of Misty, and told me they'd search for her. Tuesday: 6 AM: "We just spotted her! She saw us and ran around the corner." I got directions and sprinted over to my search team. They pointed the direction that Misty had gone--towards Embarcadero--and I kept running. As I ran, I called Alisha and told her where Misty was probably going. Alisha spotted Misty from the car. When she called out, a panicked Misty took off at full speed across Embarcadero. Alisha had to chase her all the way to Oregon Expressway, speed in front of her, screech to a halt in her path, and open the door to call to her. Misty finally saw a familiar face, and immediately jumped into the car, and into Alisha's lap. It was 6:30 AM, and 91 hours after she had disappeared, Misty was home. After taking Misty home to see the kids (and her boyfriend Zen), we took her to the vet. She was dehydrated, hungry, exhausted, covered in pine sap, and was bleeding because she had run her paws raw. But she was in good health. After some IV fluids, they sent her home with us. We gave her a bath, put her in her bed, and fed her in bed. She didn't bother chewing her food before swallowing. She spent the day in bed, recuperating. I spent the rest of the morning wandering around town taking down flyers, though this chore was made lighter by the fact that A) we had Misty back, and B) everywhere I went, people were congratulating me, shaking my hand, and fist bumping with triumph. Everyone felt like a part of the story. Misty had her collar and license on, and she has a microchip, but none of those help until someone else is able to capture her and scan them. Only 15% of lost dogs return via a shelter. We found Misty because we put in an insane amount of work (about 8 hours per day) and got the word out to as many people as possible. We also acted decisively whenever we got a hot lead, even though the first lead from the IKEA team turned out to be a different dog. The one thing I wonder is whether we could have found Misty earlier. I didn't put flyers up at the kids' summer camp on Friday afternoon because I didn't want to panic them or tell them about Misty's absence until I could get them home. If I had put flyers up then, I might have gotten the tip about Misty being seen by the Baylands Athletic Center on Friday night, rather than Monday night. At any rate, I was quite glad that only one entrepreneur asked me for money today. I gave it to him, of course, and in my ecstatic joy at getting Misty back, would probably would have committed to anything anyone else asked of me! UPDATE: MISTY HAS BEEN FOUND! THANK YOU EVERYONE! On Friday, shortly before noon, our family dog, Misty, escaped from our yard. We've been searching for her every since we discovered her absence. Now we need your help. Misty is female, two years old, weighs 30 pounds, and was wearing a pink dog collar with Palo Alto tags (License #044044). 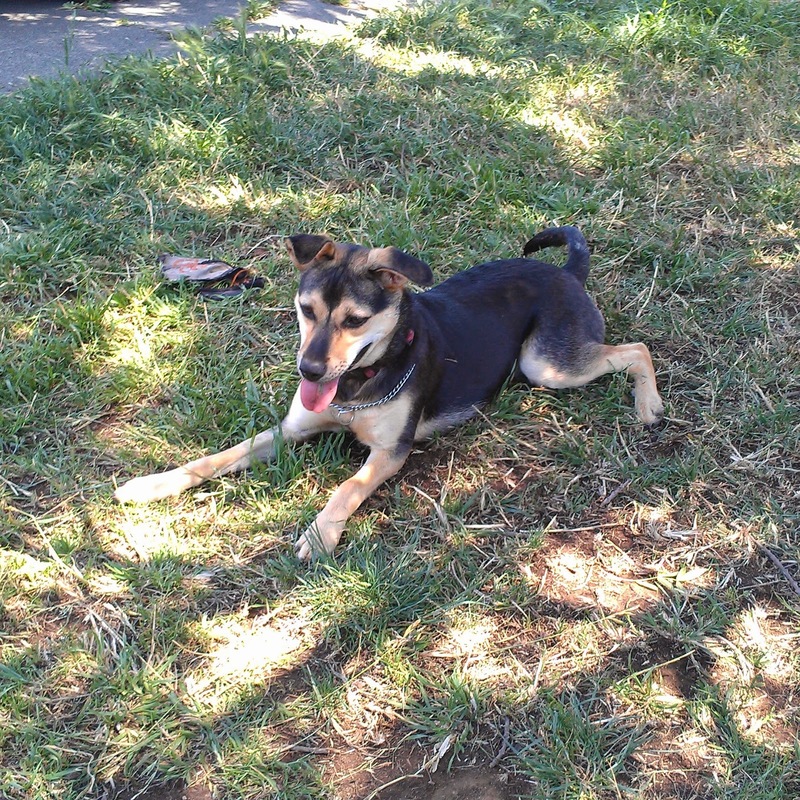 While Misty was lost near Greer Park, we have reason to believe she may have crossed Oregon Expressway, and is either North of Oregon Expressway, or might even be over in East Palo Alto (we have reports of a potential sighting near the Baylands Athletic Center on Geng Road. In addition to spreading the word on the Internet, if you're in the Palo Alto area, you can download our "Lost Dog" flyer and post it in high-traffic areas. Note that I've already posted about 50 of these flyers around Midtown Palo Alto, and along the hiking/biking trail along Bayshore. If you are in the area, and can look for Misty, keep in mind that Misty is shy with humans, so she will be hard to catch. Instead, call or text me at 650 dash 224 dash 6362 any time, day or night, and I'll come to get her. Misty is a beloved member of the family, so please do all you can to help!